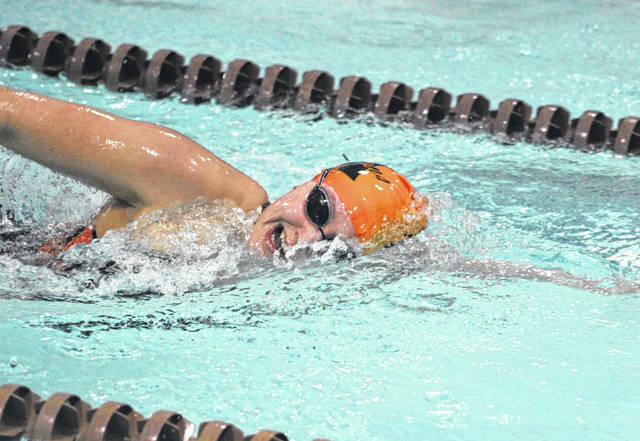 Arcanum senior Isabella Gable competes here in the 500-yard freestyle at a meet earlier in the season. Gable performed well this past weekend winning several events at the Southwest Ohio Coaches Classic Invitational. 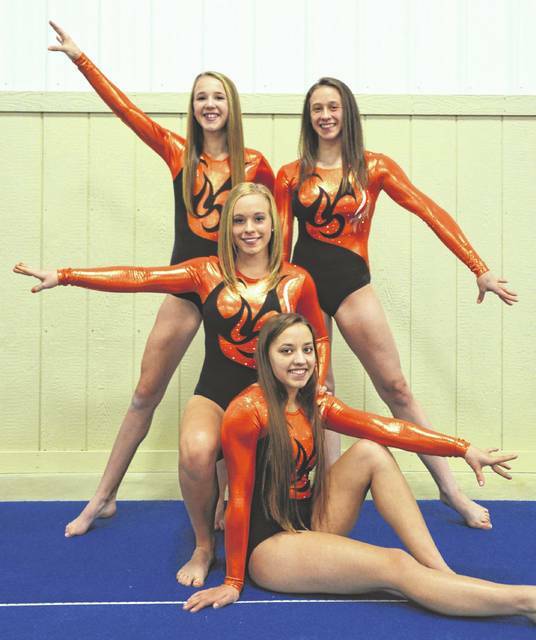 The Versailles gymnastics team took third place on Monday out of 13 teams competing in the Northmont Invitational at Gem City Gymnastics in Tipp City. Several Darke County swimmers performed well this past weekend at the Southwest Ohio Coaches Classic held at various locations including Miami University in Oxford where Arcanum, Ansonia and Tri-Village competed. Arcanum senior Isabella Gable won several events at the Miami University site including the 500-yard freestyle with a time of 5:03.75. She also won the 400 IM (4:31.56), the 1650 free (17:32.35) and the 200 backstroke (2:02.66). Gable went onto compete in the finals at St. Xavier High School’s Keating Natatorium where she placed fourth overall in the 200 back (2:04.89). Also for Arcanum, Jimmy Barry placed second in the 50 breaststroke (31.45) and eighth in the 200 free (2:02.2) at Miami University. For Ansonia, Connor Stachler placed 11th in the 100 butterfly (1:04.63) and 16th in the 200 free (2:09.91) at Miami University. For Tri-Village, Lucie Morris was second in the 50 free (25.08) and third in the 100 back (1:02.4) at Miami University, while Edie Morris was seventh in the 100 fly (1:07.7) and 12th in the 200 free (2:13.58). Versailles finished third out of 13 teams on Monday in its first competition of the season at the Northmont Invitation held at Gem City Gymnastics in Tipp City. The Lady Tigers scored 133.2 points for their third-place finish and were led by senior Jadyn Barga, who took first place in the all-around with a score of 36.75. Barga also was first in the vault (9.4), and the uneven bars (9.2), and she finished second in the balance beam (8.85) and in the floor exercise (9.3). Also for the Lady Tigers, Madison Ahrens finished fifth in the all-around with a score of 34.45. 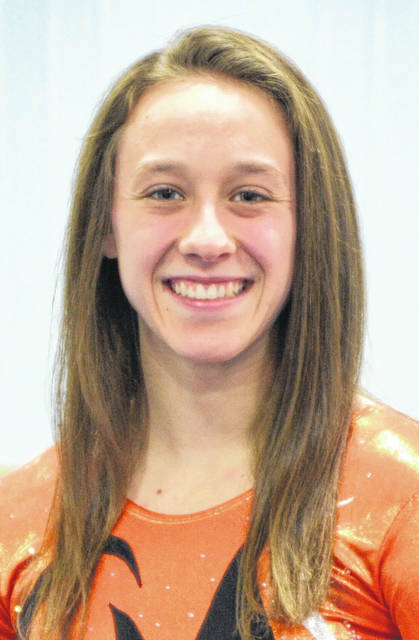 She was the balance beam champion (9.0), fourth in the floor exercise (9.2) and eighth in vault (8.4). Junior Ellie Barga was seventh in the all-around with a score of 34.00. She finished sixth on the uneven bars and ninth on the balance beam (8.55). Greenville sophomore Emily Marchal, who competes with the Versailles team, had a good start to the meet on vault and uneven bars, according to coach Jessica Pothast. There were 13 schools and 116 gymnasts competing at the meet. The girls next competition is scheduled for Saturday, Jan. 26 beginning at noon at Centerville High School. Versailles bowled a non-conference match against Parkway in a make-up match at Speedway Lanes on Jan. 15. The Lady Tigers got off to a good start with a first game 777 to Parkway’s 589. Scores in game one were Morgan Barlage 202, Kalysta Thobe 160, Haddi Treon 147, Morgan Heitkamp 141 and Natalie York 127. The second game line up included Heitkamp 207, Jena Mangen 181, Barlage 169, Lindsay Cheadle 145 and Thobe 143. Versailles rolled an 845 compared to Parkway with 541. Bowlers in the first baker game were Cheadle, York, Mangen, Heitkamp and Barlage. Versailles had a 194 compared to Parkway’s 122. The second baker game had Cheadle, York, Mangen, Heitkamp and Barlage. Versailles had 137 and Parkway rolled 73. The third baker game consisted of Cheadle, Thobe, Mangen, Hietkamp and Barlage. Versailles rolled 153 to Parkway’s 110. The fourth baker game was comprised of York, Thobe, Mangen, Barlage and Heitkamp. Versailles rolled 128 to Parkway’s 109. The fifth baker game consisted of York, Thobe, Mangen, Barlage and Heitkamp. Versailles rolled 158 to Parkway’s 111. The Lady Tigers record is now 8-3 overall and 6-1 in conference with their next match scheduled for 1 p.m. on Saturday, Jan. 26 against Fort Loramie at Union City. Greenville won its second match in a row last week with a narrow 89-pin victory over Tippecanoe. The Lady Wave leader was Kelli Kretschmar with a 324 series (169-155). She was followed by Shila Thompson’s 291 series (145-146). Individual contributors in the match for Greenville were Meghan Holman (184), Jenna Netzley (165), Mariah Nicholas (148) and Kaitlyn Schmidt (124). Abigail Lee led Tippecanoe with a 336 series (197-139). After a few disappointing scores in the first game, the Mississinawa Valley bowling team came back stronger in the second game and baker games to defeat Minster by 59 pins in a makeup game from earlier this season. MV started out with several splits and missed spares in the first regular game round. However, they regained the lead in the second round and added to it in the baker games. The Blackhawks were led by Zac Longfellow with a 355 series (167-188) and he was followed by Colton Hardwick with a 350 series (167-183). Mason Hardwick also rolled a 300-plus series (311) with games of 165 and 146. Cameron Shimp had an individual game of 201, while Roman Dircksen threw a 163 game and Matt Slyder had a 113 game for Mississinawa Valley. Mark Zeiler rolled a 498 high series against Tippecanoe, but it wasn’t enough as the Red Devils prevailed in the overall match by 193 pins. Zeiler rolled individual games of 210 and 288 for his series total, which was highest of all bowlers in the match. Also for Greenville, Adam Kermeen had a 328 series (180-148) and Caiden Lutz had a 313 series (140-173). Individual game scores for the Green Wave were Chris Hadden (204) and C.J. Grider (128). Austin Post led Tippecanoe with a 405 series (225-180) and Aaron Davis had a 382 series (192-190). Arcanum took a 12-point lead into the fourth quarter against Newton on Friday and held on for a 63-46 Cross County Conference win. Carter Gray had a game-high 29 points to lead the Trojans (9-5, 5-3 CCC). He drained six 3-pointers and was 9-for-12 from the free throw line for the majority of his point total. He was 6-for-7 at the free throw line just in the fourth quarter as Newton fouled frequently to give themselves a chance. The Trojans were 12-for-21 in all at the free throw line in the fourth quarter. Wade Meeks was the next highest scorer for Arcanum with 11 points and Evan Atchley added 10. Chet Jamison led Newton with 17 and Ryan Mollette had 10. Jamison had 10 of his points in the fourth quarter. Franklin-Monroe defeated Milton-Union 64-55 last Friday in a non-league battle in West Milton. The Jets led 13-10, 35-26 and 48-32 at the quarter breaks with Ethan Conley leading FM with 26 points and eight rebounds. He was followed by Jordan Rhoades, who scored 13 and had 3 rebounds, and Conner Crist with 12 points and 7 rebounds. Rounding out the Jets’ scoring was Gage Vance with 2 points, Luke Booher with 3, Gabe Sargent with 2, Jackson Crist with 4 and Ky Cool with 2 points, 3 steals and 5 rebounds as the Jets improved their record to 8-6 overall. The Franklin-Monroe junior varsity also won, 43-39. Noah Walker had his highest offensive output of the season last Thursday in leading the Green Wave with 24 points. However, Samari Curtis finished with a game-high 33 points in leading Xenia to a 94-66 Greater Western Ohio Conference victory. Tyler Beyke also scored 13 points for Greenville, while Xenia got contributions from Dylan Hoosier (16) and Zack Gaither (11). The Lady Blackhawks lost a tough game on Saturday to Twin Valley South by a score of 38-35. The Blackhawks led the way the entire game by scores of 19-6 at the end of the first quarter, 23-13 at halftime and 33-23 at the end of the third quarter, but in the fourth quarter Mississinawa Valley only scored 2 points while TVS scored 15 for the come-from-behind win. Leading the way for the Blackhawks were freshman Mattie Hiestand with 11 points, and senior Sidnie Hunt with 3 points and 20 rebounds.